Nachfolgend noch der facebook-Post von Sandy Williams, in dem sie auf dieses Problem eingeht. So cool! And also sad! 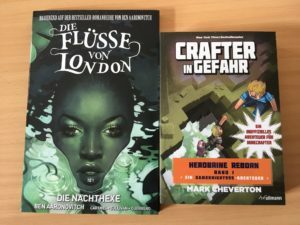 I received a message from the person who translated the Shadow Reader books into German. She said she’s received email from readers who enjoyed the first two books and wanted the third. And that’s the sad part! The German publisher isn’t interested in purchasing the third book, and since my US publisher owns ALL my foreign rights (one of the reasons I’ve decided to indie publish; I hate that my audio and other foreign translation rights are just sitting there not being used), I don’t have the legal right to sell that book to another publisher or have it translated on my own. Just think about that, you guys: the German readers are left hanging at the end of The Shattered Dark. Big, huge sad face here! Everyone join me in giving the German readers are hug.